Buckwheat is such an amazing ingredient. I love using buckwheat flour and groats in loads of different ways but in particular, it has the most amazing texture for porridge, it tastes like a creamy rice pudding! 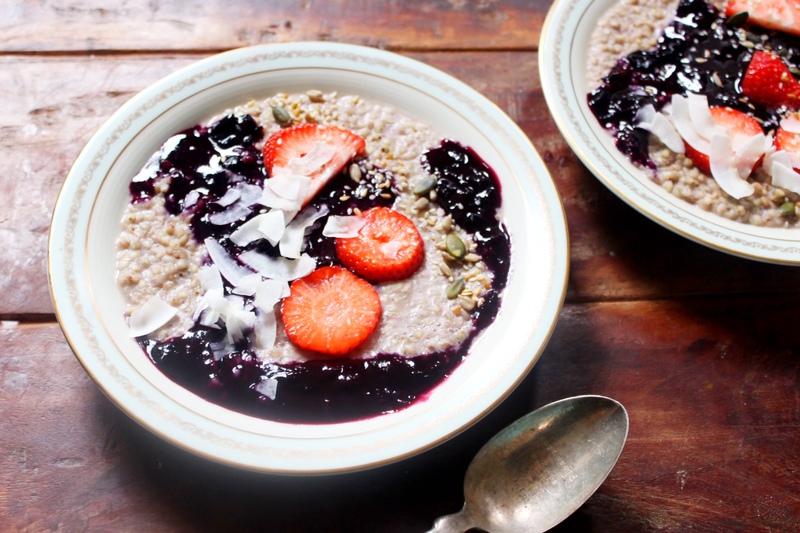 Porridge is one of my absolute favourite things, I crave it and have it for dessert as often as for breakfast! There are so many wonderful ways to enjoy it but this one is really special- it looks so pretty and tastes even better. Add the buckwheat and water to a saucepan on medium heat. Let it cook until almost all of the water is absorbed, then add in one cup of almond milk and cook until almost all of the almond milk is absorbed. These two steps should take about 15 minutes in total. Next, add in the sweetener and the last cup of almond milk. Cook until the buckwheat is soft and the porridge is your desired runniness. It should take about 3 minutes. 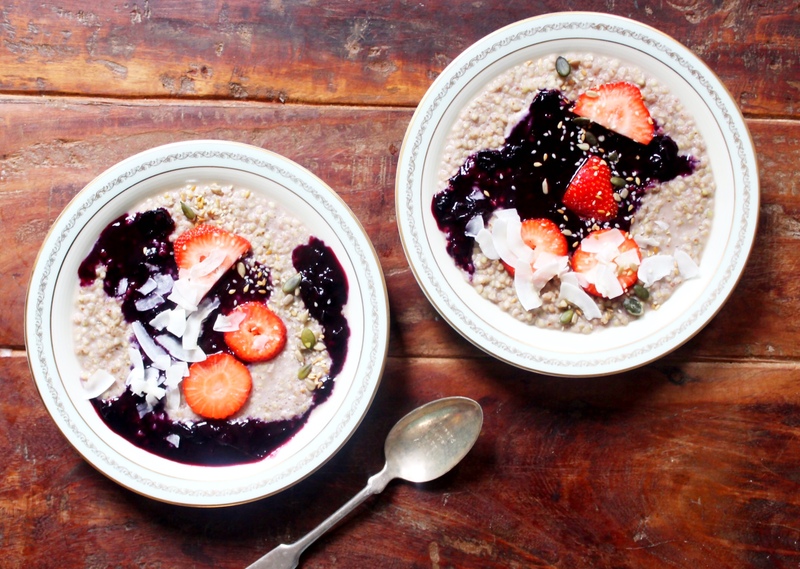 While the porridge is cooking, make the blueberry sauce. Add the blueberries and water to a saucepan on medium heat. When the water is hot, use a potato masher or fork to squish the blueberries. Keep squishing and stirring for about 3 minutes until you have a gorgeous deep purple/blue sauce. 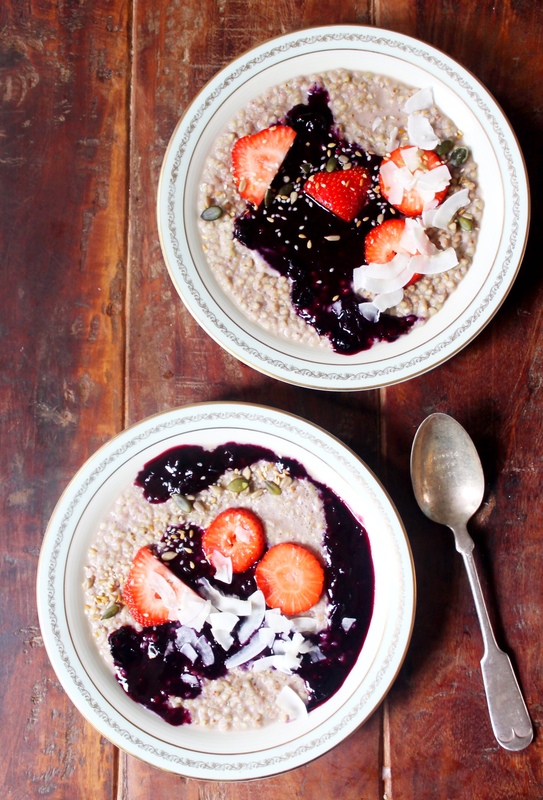 Pour the porridge into your bowls and spoon in the beautiful blueberry sauce. Top with any additional toppings and serve! Would this also work in the microwave?? I always do the oats porridge in the microwave during the week and it turns out fine, but I do like to cook it in a saucepan on the weekend, it is nicer!